A harbor light is covered with snow and ice on the Lake Michigan at 39th Street Harbor, Jan. 30, 2019, in Chicago. Homelessness in the US has risen over the past two years. Homelessness has been rising in the US for the past two years, underscoring the country’s steep levels of inequality. This crisis has prompted cities and states to declare states of emergency and led the UN to intervene. You can join us in taking action on this issue here. When Candice Payne learned that dozens of homeless people were stranded outside during Chicago’s recent polar vortex, she immediately charged 30 hotel rooms to her credit card to get them out of the cold, according to the New York Times. “It was 50 below, and I knew they were going to be sleeping on ice and I had to do something,” she said in an interview with the Times. The deaths of at least 21 people across the US have been attributed to the extreme conditions caused by the polar vortex. 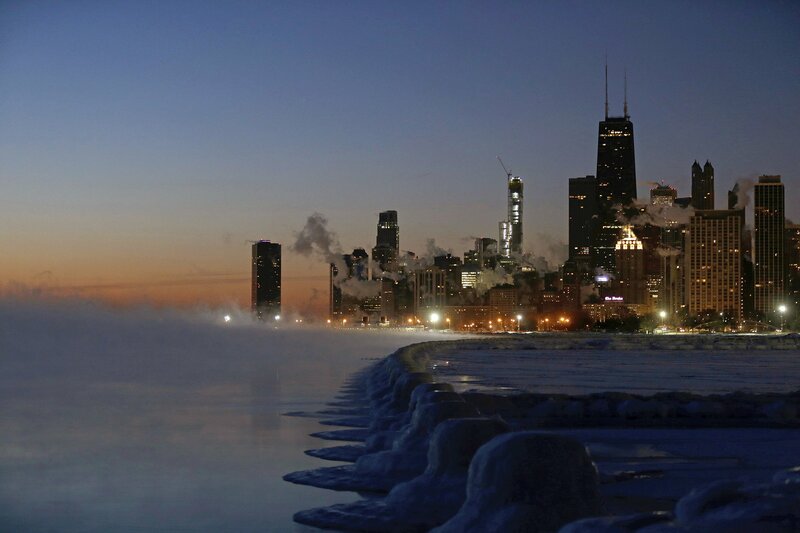 Three people in Chicago alone died from last week’s frigid temperatures. Many homeless men and women had been using propane tanks for heat on Roosevelt Road near Chicago University in what is known as “Tent City,” but an accidental fire forced the local fire department to confiscate the tanks to prevent future conflagrations, the Chicago Tribune reports. Ice forms along the shore of Lake Michigan before sunrise, Thursday, Jan. 31, 2019, in Chicago. After Payne’s initial down payment of several hundred dollars, she asked for further help through a post on Instagram and received enough support from people across the country to pay for a total of 60 rooms through the rest of the week, when temperatures were expected to rise. "We don't get that type of help," one of the homeless men, Jermaine, told CBS Chicago. "I really needed them at that point, so they came right in time." The spontaneous act of charity attracted other volunteers in the area, who chipped in to bring food and supplies to the rooms, and even set up makeshift kitchens in some of the hotel rooms. “I am a regular person. It all sounded like a rich person did this, but I’m just a little black girl from the South Side,” Ms. Payne told the Times. “I thought it was unattainable, but after seeing this and seeing people from all around the world, that just tells me that it’s not that unattainable. We can all do this together,” she added. Now Payne, who is a real estate developer, is working on a long-term solution to address the problem by crowdfunding money to buy and renovate houses to shelter people experiencing homelessness. In two days of fundraising, Payne has raised nearly $15,000 toward her goal of $25,000. Her activism highlights the plight of homelessness in the US. There are approximately 5,657 homeless people in Chicago, a quarter of whom live on the streets without a regular place of shelter. Across the US, homelessness has risen over the past two years. In 2018, an estimated 553,000 people were homeless on any given night. People experience homelessness for a range of reasons including high cost of living, health problems, domestic violence, and unemployment. Elderly people and communities of color are disproportionately represented in this population and natural disasters are a growing driver of homelessness. Homelessness can negatively impact many aspects of people’s lives. Homeless people face higher rates of malnutrition and have poor access to healthcare. Children who are homeless are more likely to drop out of school, and homeless women face higher rates of sexual violence. Cities and states across the country have devoted more resources to resolving the homelessness crisis in recent years, and courts have stepped in to protect the rights of homeless people to receive food and sleep outside, but many remain without consistent shelter. Being homeless is hard year-round, but it becomes considerably more difficult in the winter when illnesses like hypothermia become a major threat due to cold temperatures. In fact, around 700 people at-risk of or experiencing homeless die from hypothermia every year. Payne’s act of generosity helped the people living in “Tent City” survive the latest polar vortex, but protection from future extreme weather events will likely require a more comprehensive plan than temporary hotel stays.